An interesting recent case where one of the invoice finance companies passed a client to us, that they were unable to assist. This particular case was a specialist recruitment company, dealing with the education sector - staff such as nursery teachers. The agency dealt with 100% permanent placements, that is recruiting for permanent roles, rather than temporary staff. Temporary staff recruitment is very straightforward to finance, as staff are normally placed for short specified period which are subject to signed timesheets. These evidence the debt and so it is a very attractive sector for invoice finance companies (hence 20 times more recruiters use this kind of funding, than the UK average). The funder will provide a percentage of the invoice value (called a prepayment) to the recruiter, before the invoice is paid, improving their cash flow. However, permanent placements are not so straightforward. What tends to happen is that the invoices are larger, for a percentage of salary following a successful placement. The biggest issue is that the underlying terms often include a rebate provision. This states that if they new member of staff doesn't remain in the role for more than a certain amount of time, often 12 weeks, a rebate of part of the placement fee becomes due to the employer. These tend to work on a sliding scale, te longer the employee remains within the role, the less the rebate is, based on a sliding scale mechanism. After a certain period, often 12 weeks, there is no further opportunity for a rebate. This creates an issue when funding the invoice. If the staff member leaves, and a rebate becomes due to the employer, this can reduce the value that is payable in respect of the invoice. If the finance company pays the agency a prepayment against such an invoice, they could end up collecting in less than the value of the prepayment. Some invoice funders operate systems whereby a certain percentage of permanent placements is allowed. This applies where a recruiter offers both temporary staff and permanent labour. However, in some cases the agency provides only permanent placements - so there are a limited number of funders that will accept 100% perms from agencies. This is one of those cases where the agency is 100% permanent placements, without any temp labour to dilute the risk - hence it was a problem for the funder that referred them to us. The good news is that there are funders that will be able to offer significant levels of prepayments against these invoices, despite them all being for perms rather than temps. The other benefit with the particular business isn that staff in that particular sector have to undergo stringent checks (for child protection) and this tends to mean that the number of staff moving between postions after just a few weeks is very low. It is early days but this is an example of how a specialist invoice finance broker can help you find funding when you have been declined by providers. There are over 90 providers in the UK at present, there are many differences in approach, and risk appetite between them. 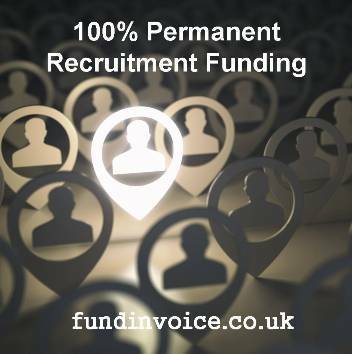 We specialise in helping recruiters find the funding that they need.